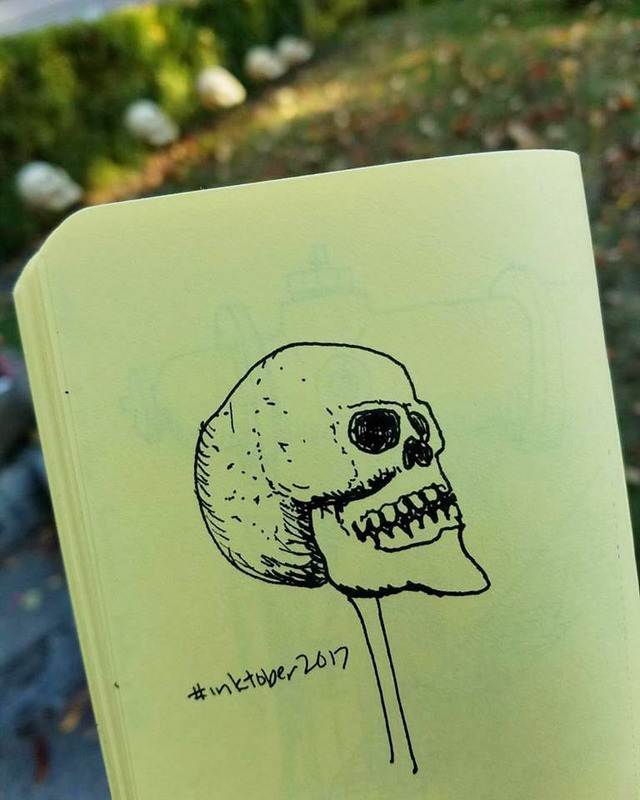 Happy Halloween and happy end of InkTober! Are you sad that it’s over – or relieved? 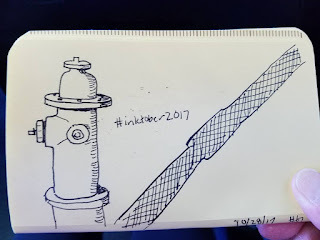 As I mentioned in my second trimester review, I began InkTober this year with a bit of trepidation about being able to keep up with daily ink sketches while also working on my time-consuming graphite class exercises. 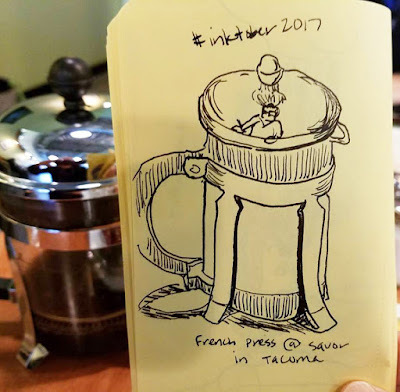 But on most days it was a relief to go out and do small, quick sketches from life for InkTober instead of labor-intensive graphite drawings from photos. On some busy days, though, I admit that I wanted to skip it (and once I almost forgot until fairly late in the day) – but I didn’t. I have often told people who say they don’t have time to sketch that it doesn’t have to be a huge time commitment, so I decided I would simply practice what I preach. 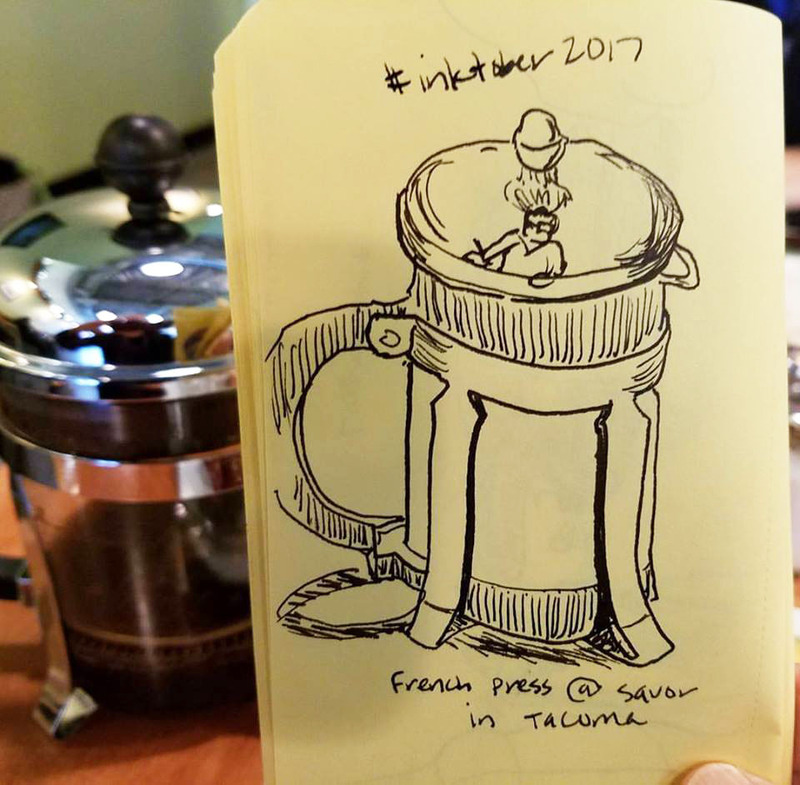 Except for one I did at the Funko sketch outing, none of my InkTober sketches took more than 15 minutes to make. While it’s not part of Jake Parker’s original InkTober initiative, as long as I’m participating in the project, I like to give myself a personal goal. I didn’t stick with ballpoint pen for the whole month as I had originally planned, but I did stay with the second part of my goal: to practice my hatching skills. That, too, was tempting to skip. 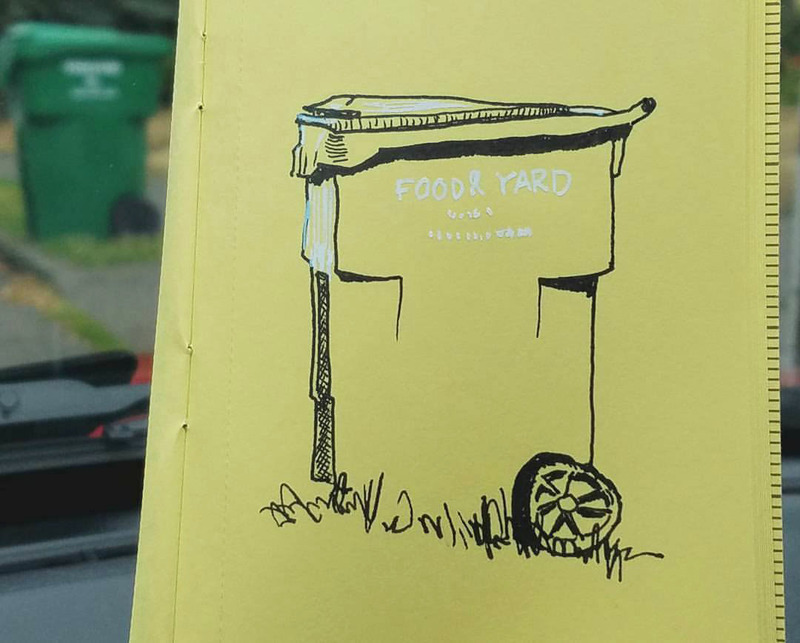 Without InkTober, I regularly make small brush pen sketches in Field Notes notebooks, so it would have been easy to fall back on a familiar tool and habit. But except for a couple of sketches, I managed to include at least some hatching. As the month went on, hatching became easier. I started to really appreciate how effective hatching can be in economically showing the direction of a curved surface. 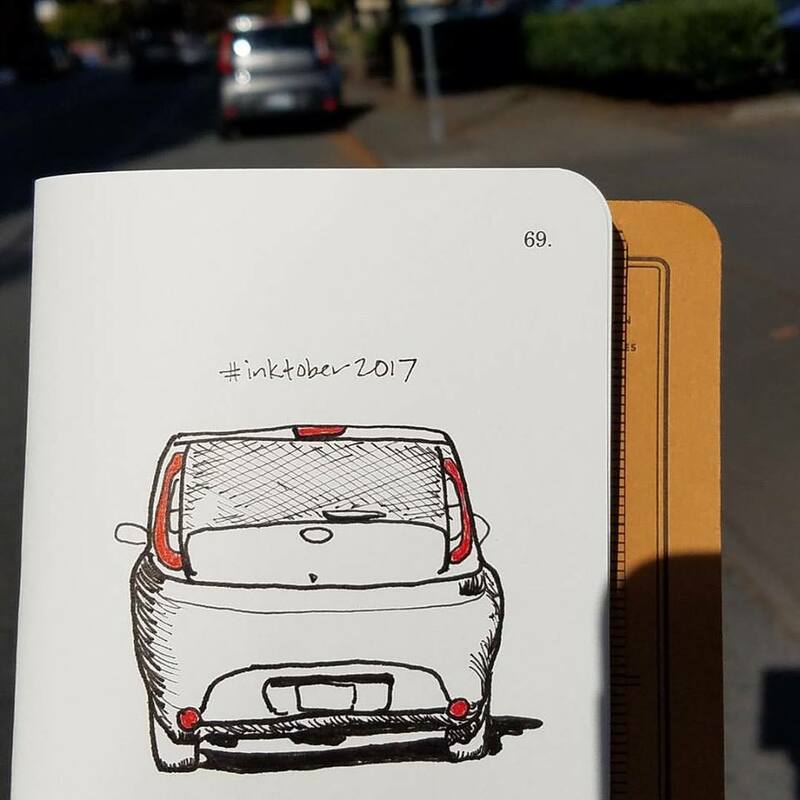 The most surprising outcome of InkTober 2017 is that I unintentionally developed a bit of a theme: cars! 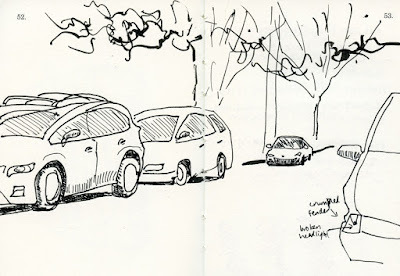 Although they are no longer the sketching nemesis they used to be, and they appear frequently enough in my day-to-day urban sketches even without InkTober, cars and I have never been on friendly terms. On busy days, though, I often found myself squeezing in a quick sketch between errands or appointments, so it was easiest to draw whatever car was parked nearby. 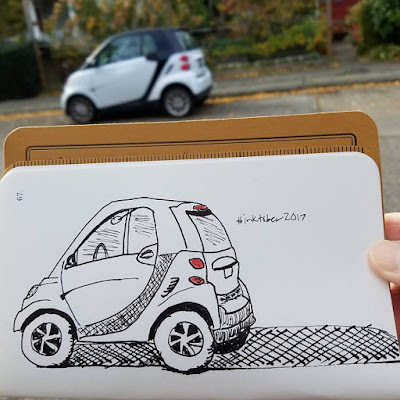 Interestingly, cars turned out to be ideal for hatching practice: They’re made of curving, hard surfaces with lots of challenging, irregular shadows! 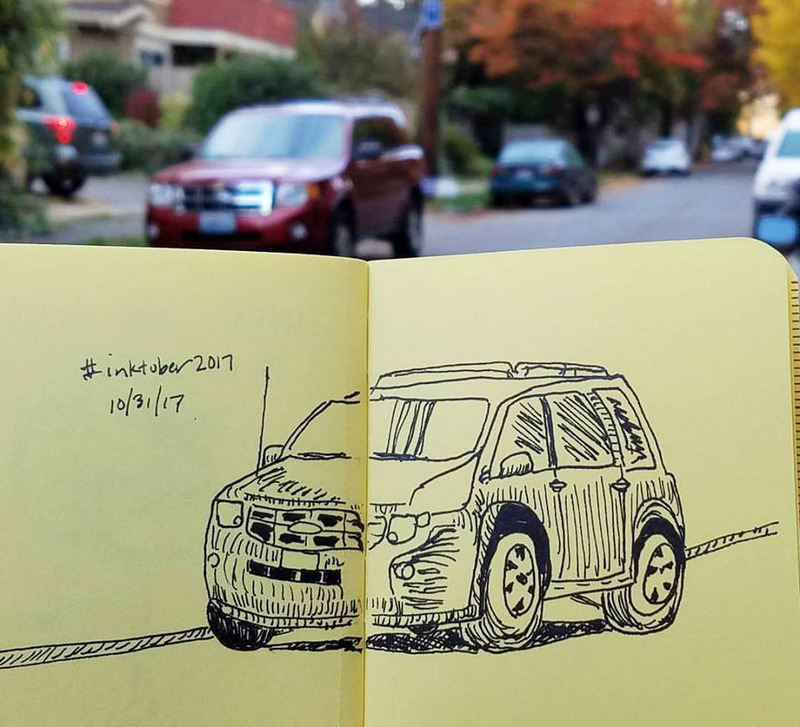 Since I typically would not choose to sketch ordinary cars on the street as primary sketching subjects, I got some much-needed practice. 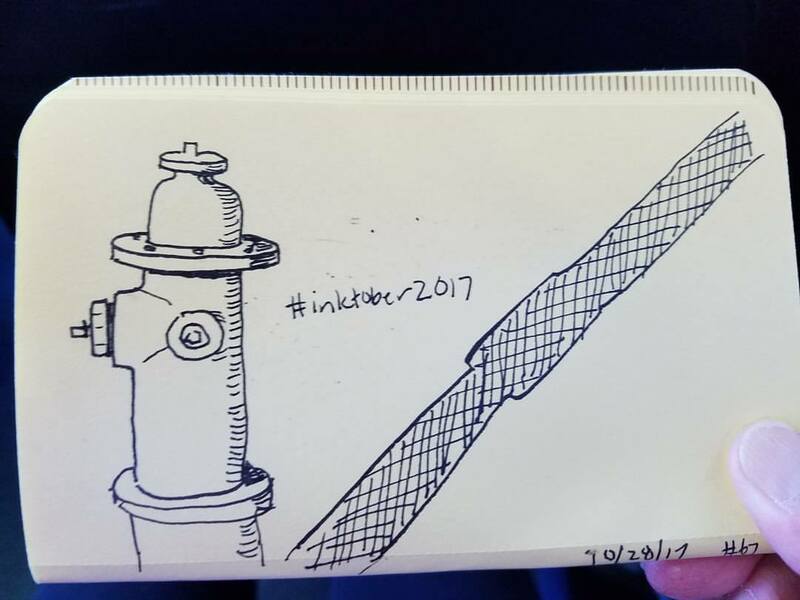 Overall, despite the challenges, I had a great InkTober (see all my sketches from the month in this Flickr album)! How about you? 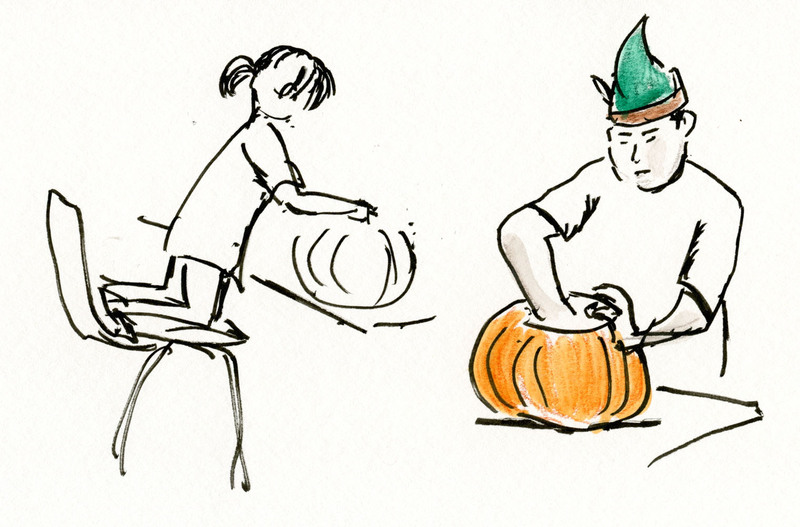 It was a busy weekend for October festivities. 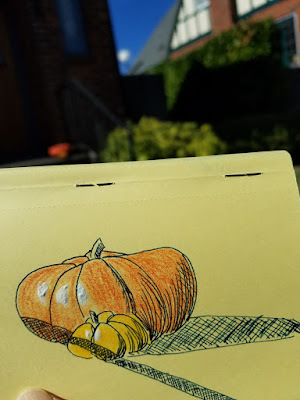 After sketching with USk Seattle on Friday at Swansons, which was decked out for fall, I went to the Northgate Community Center for a pumpkin-carving party. My friend Alice is the primary coordinator for this annual neighborhood event, where families receive free pumpkins and refreshments while they decorate their pumpkins to the Thriller soundtrack. Last year was the first time I sketched this event, and it really scratched my itch for childhood nostalgia (without the mess of actually carving a pumpkin). 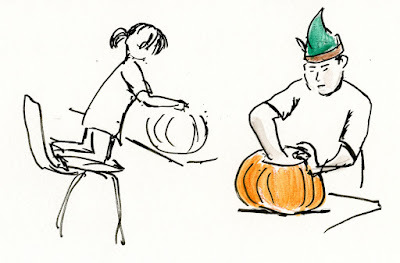 By the time I got there, the party was in full swing (Alice reported that more than 225 pumpkins were given out that day). I was impressed by how focused many of the children were by their tasks. 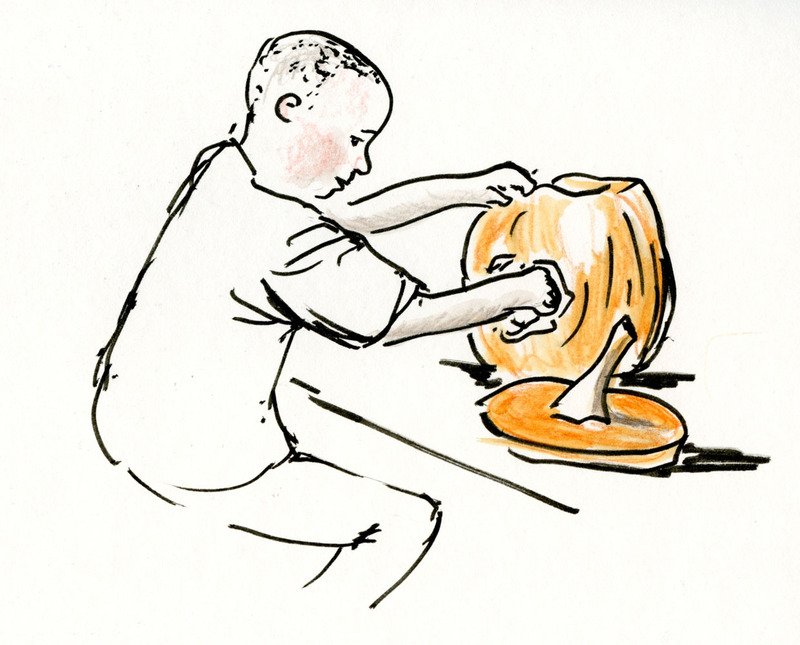 Even young kids wielding plastic tools were busily scooping, digging, cutting and marking their pumpkins. 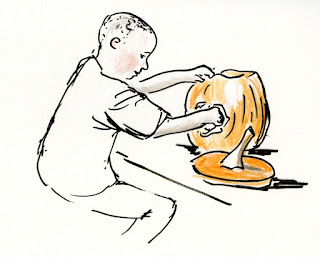 Parents, too, were elbow-deep in pumpkin guts or just trying to manage kids who were less into carving and more into throwing seeds. Then Sunday afternoon was the annual Maple Leaf Halloween Parade. Young kids, their parents and dogs, all in costumes, walked slowly and somewhat haphazardly from Fifth Northeast to Maple Leaf Park, where more festivities ensued. 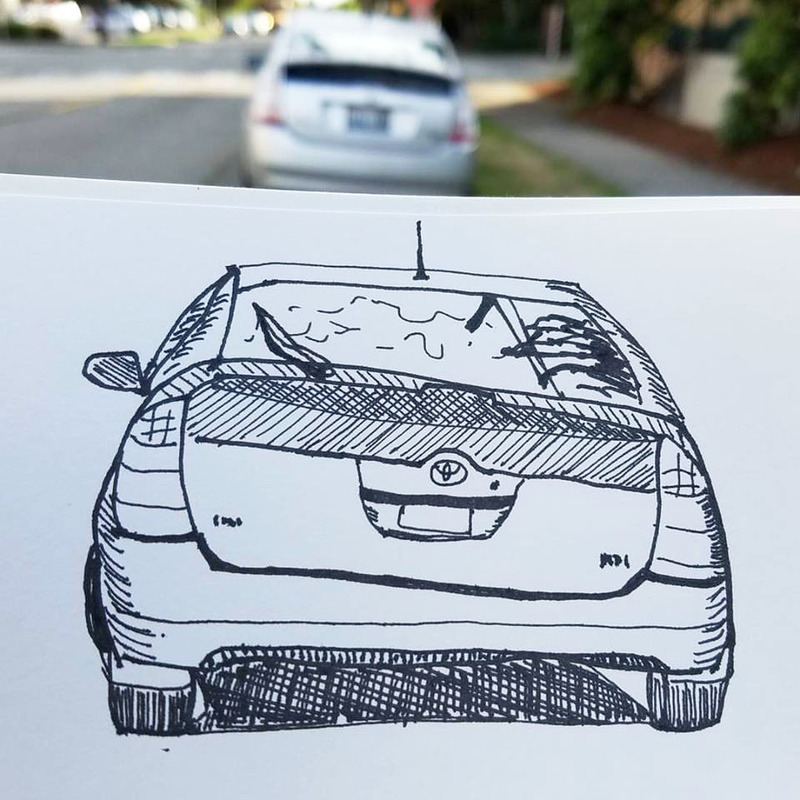 I followed along from across the street, quickly trying to grab a sketch when I could (it reminded me of the Women’s March in January when I got good practice sketching as I walked). I have been working so hard on landscapes lately and not going to life drawing sessions or even coffee shops that I felt very rusty sketching these kids. 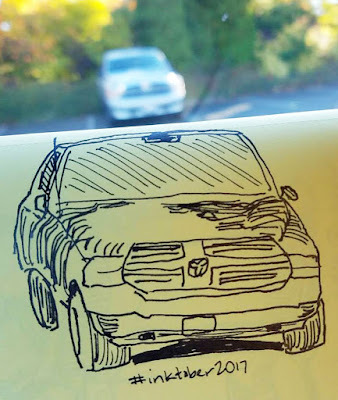 I like to think of myself as a well-rounded urban sketcher – I don’t ever want to say, “Oh, I don’t do _____” (fill in with challenging subject matter) as I sometimes hear other sketchers saying. As much as I dread winter weather, I am looking forward to being forced indoors so that I can practice drawing people again and regain balance. Urban Sketchers Seattle made one of our semi-annual treks to Swansons Nursery yesterday – this one for Halloween (Christmas is coming up). 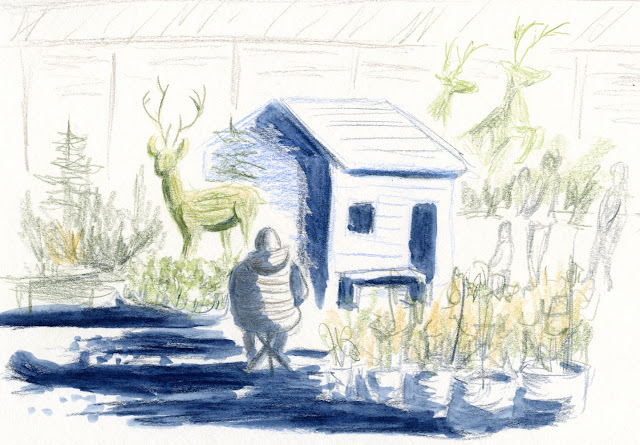 The dinosaur topiary I sketched last year wasn’t ready, but several reindeer topiary pranced around instead. 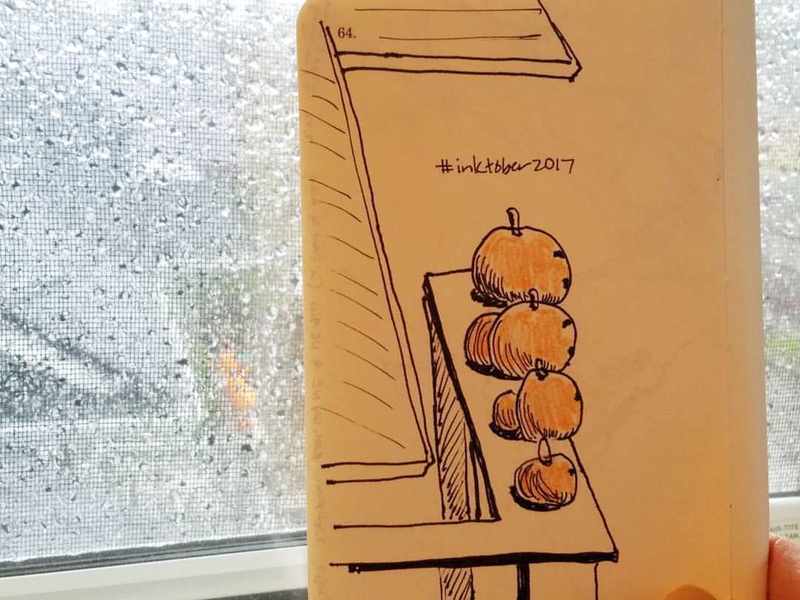 When I looked around for a good angle, I spotted Sage sketching a large display next to the children’s playhouse, and I decided I liked that view, too. 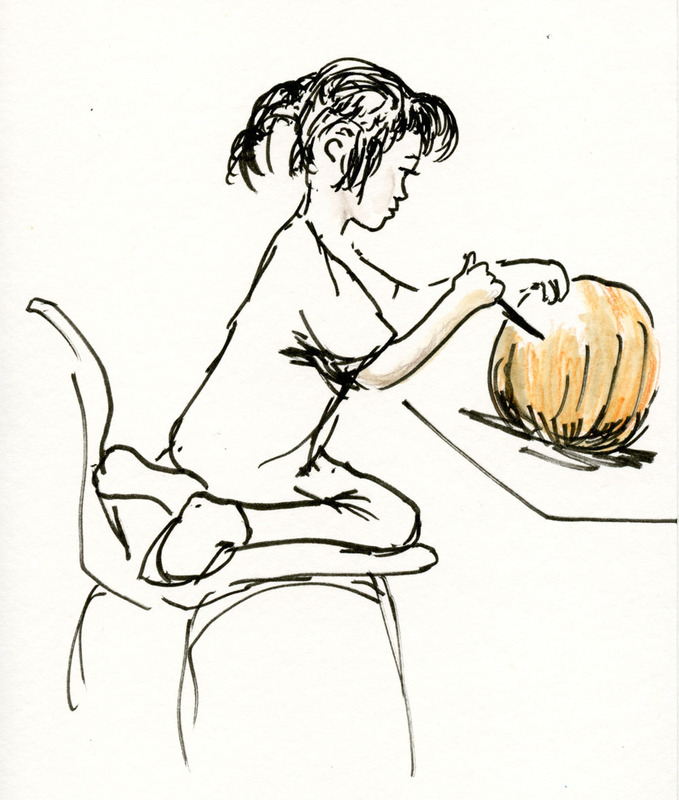 Huge piles of pumpkins and other gourds, a hay bale maze, some young goats like the ones I sketched last year, scarecrows, a tractor. . . Swansons was full of fun things to sketch. 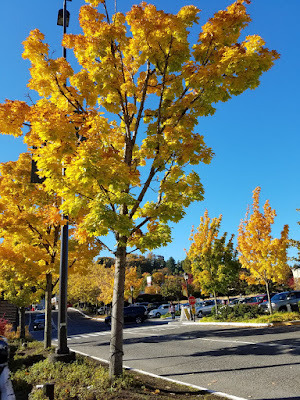 But I had homework to do, so I took advantage of the beautiful sunshine to wander out to the back end of Swansons lot, which was full of many types of trees. . . (stay tuned). When I was a child, I remember looking through our family photo albums and noticing that while there were many photos of my oldest brother Richard, my sister Linda and myself when we were babies, there were very few of my brother Frank. When I was older, I came to understand the reason: Frank was born in 1942 inside Tule Lake internment camp during World War II, where incarcerated Japanese Americans were not allowed to have cameras. My mother explained to me that the few photos of him during those years were taken by friends in the military who happened to be visiting them in camp and later gave my parents the photos. 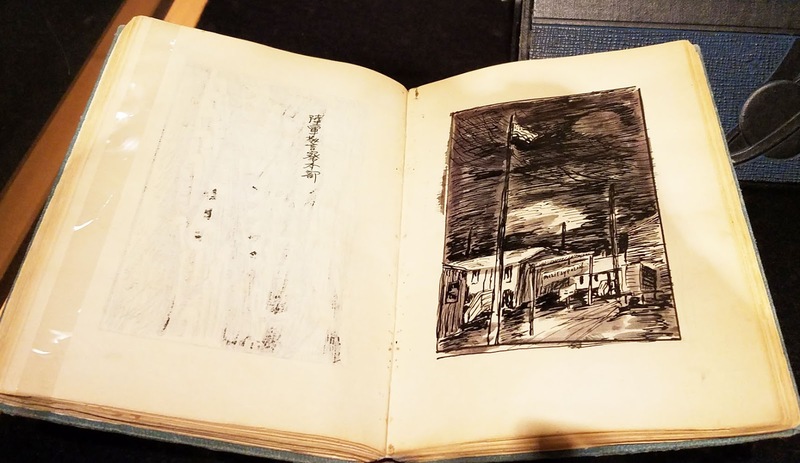 The sketchbook and paintings of Takuichi Fujii, now on exhibit at the Washington State History Museum, are a rare opportunity to view first-hand images of the internment experience where photography was not allowed. 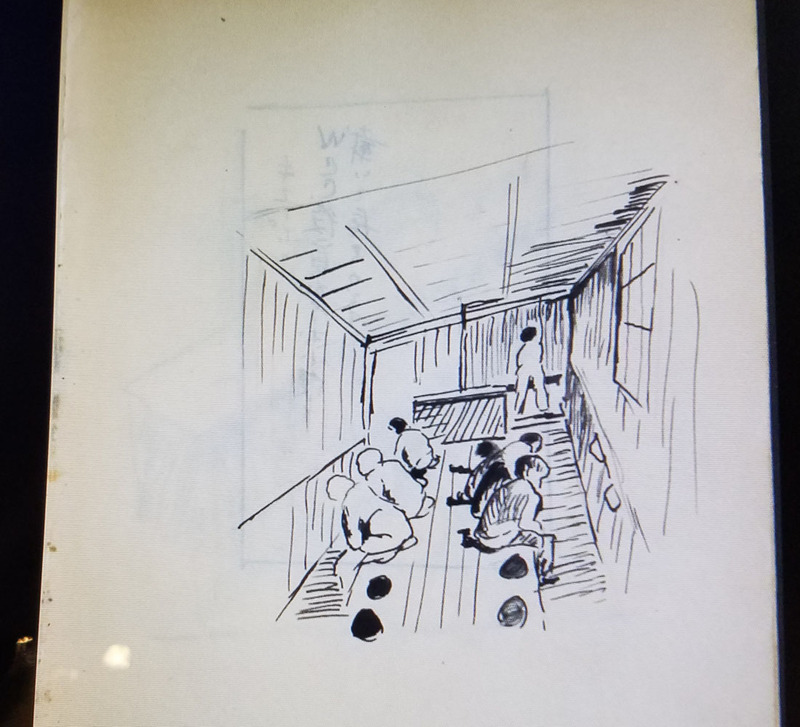 A first-generation Japanese American, Fujii was already a painter when he was first confined to the Puyallup detention center and later relocated to Minidoka, Idaho (the ultimate destination of my family, too). 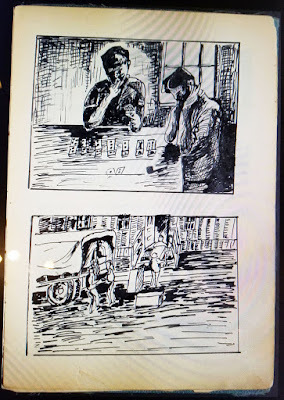 His 400-page sketchbook shows raw pen-and-ink drawings of his day-to-day life: people lining up for meals; using toilets and showers with no privacy, not even curtains between stalls; killing time by playing cards; the watchtowers and military guards. On the facing pages of sketches, Fujii wrote diary entries describing what he saw and experienced. The actual sketchbook is displayed in a glass case. 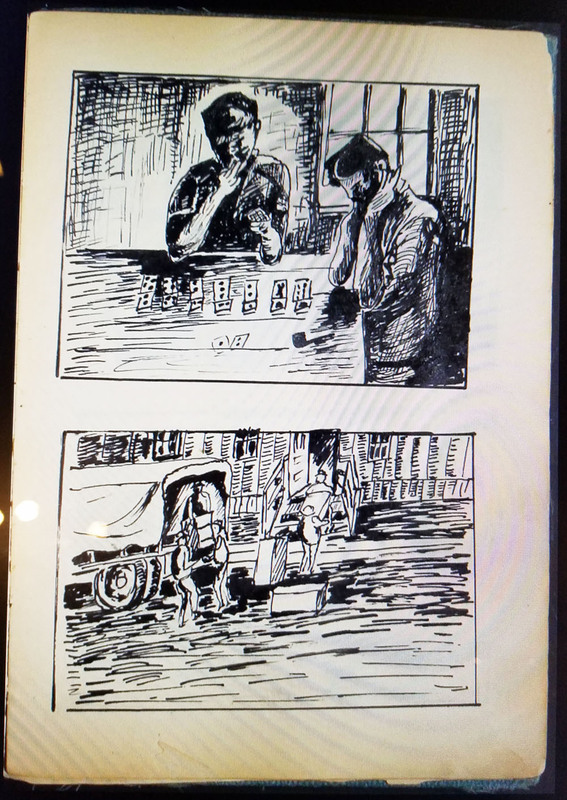 While the finished paintings are interesting and more polished, I found the sketches to be the most moving and heartbreaking images to view. My only complaint about this excellent exhibit is that the sketchbook pages can only be viewed as a digital slideshow that advances automatically. I would have liked to have studied a few of the sketches at my leisure. I also wish each page of his written diary had been translated as part of the slideshow. 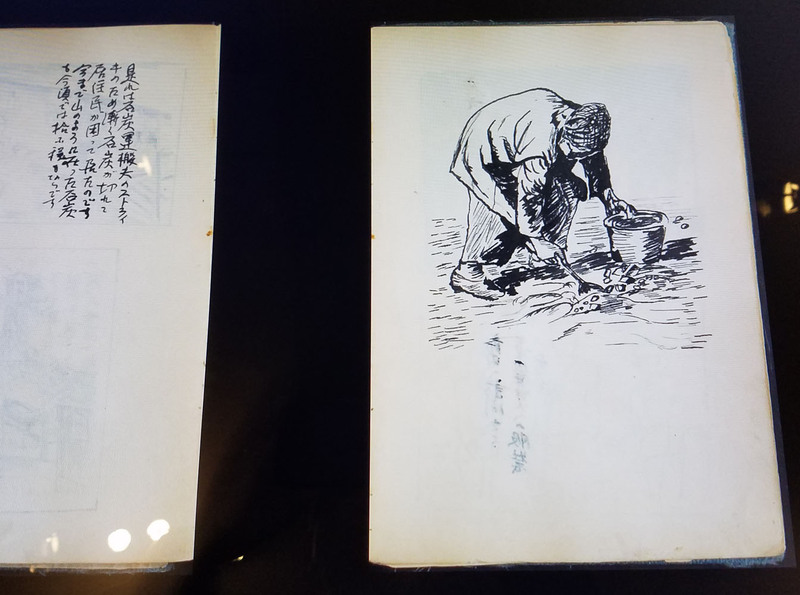 Individual sketchbook pages are shown in a digital slideshow. 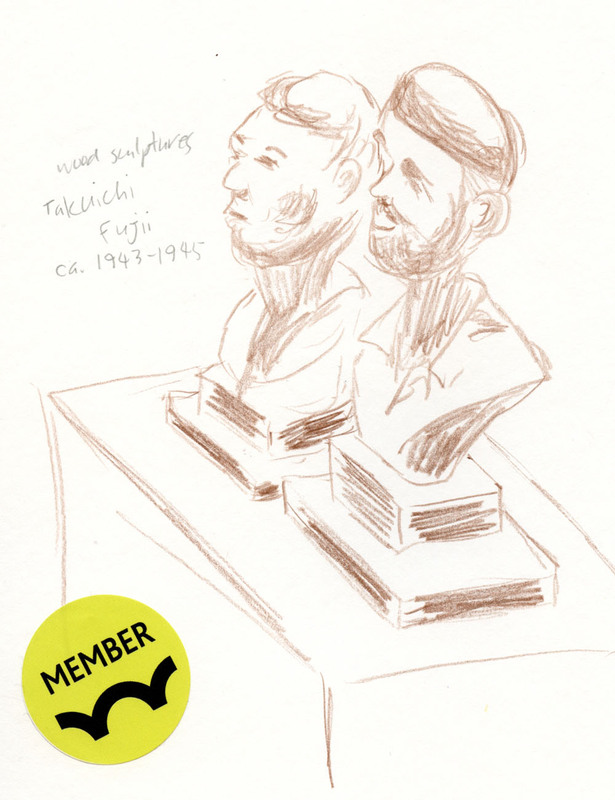 Fujii may have been one of very few reportage sketchers of the Japanese American internment experience, with his work only now having an audience. Witness to Wartime is on view through Jan. 1, 2018. We’re having the kind of October days I used to see only on TV when I was growing up – kids walking home from school in sweaters, crunching through leaves, the late-afternoon sun casting long shadows. Pure fiction! Reality was trick-or-treating with a raincoat over my costume, trying to keep my candy from getting soggy. And yet here it is only a few days before Halloween, and we have been treated to some rare days of warm (low 60s!) sunshine and blue skies. 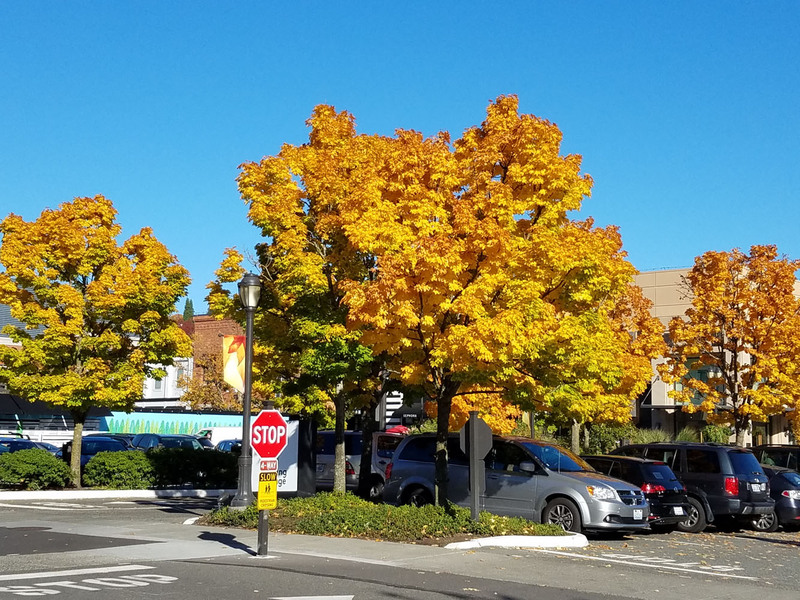 Tuesday on the way home from class at Suzanne’s Montlake neighborhood studio, I took the long way home past the arboretum and across the University Bridge, where the trees are ridiculously brilliant with color. 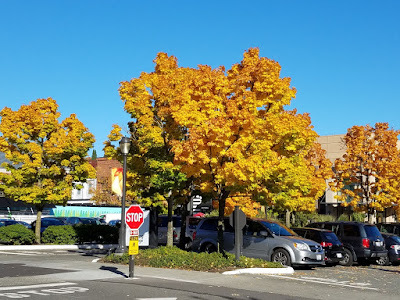 I pulled into University Village and walked around for a while enjoying all the many maples. 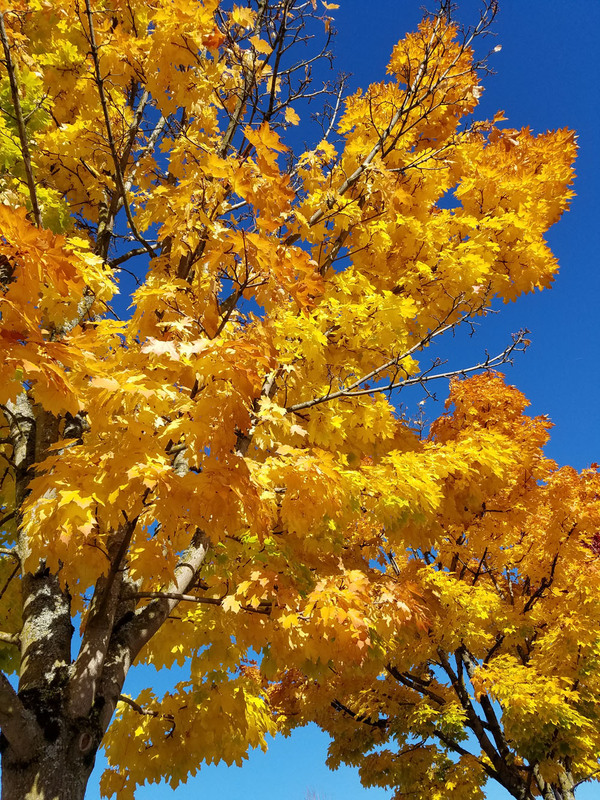 I’m not sure if their leaves will ever get to red before they fall off (or maybe this variety doesn’t), but I don’t care – against that clear blue sky, yellow-orange is fine with me. See below for a taste of the eye candy. Between InkTober and my graphite drawing class, I have been jonesin’ for color. 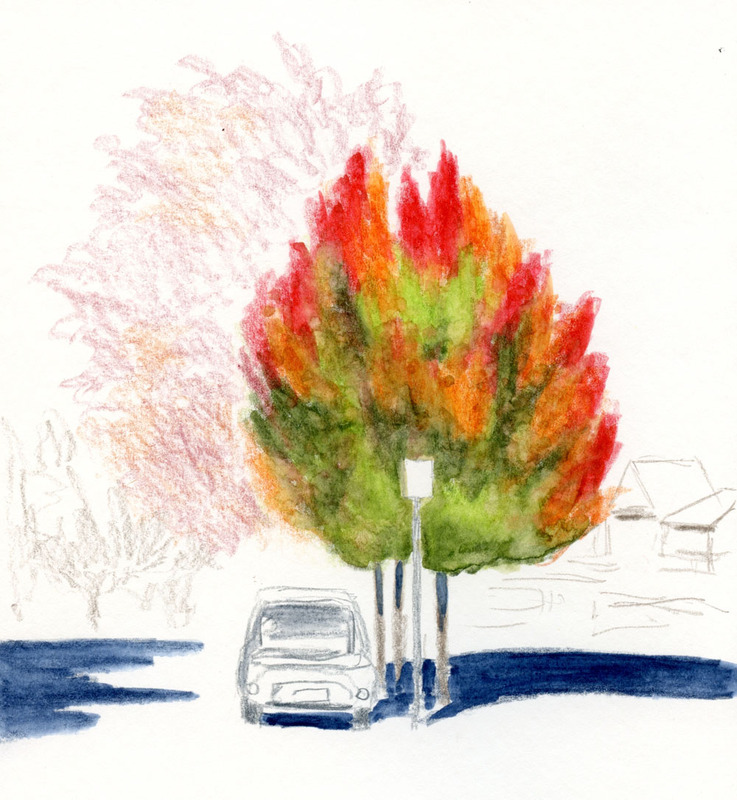 Driving home from the post office in Wedgwood, I spotted this maple blazing ahead of me. I came to the proverbial (though not literal) screeching halt as I pulled over immediately. 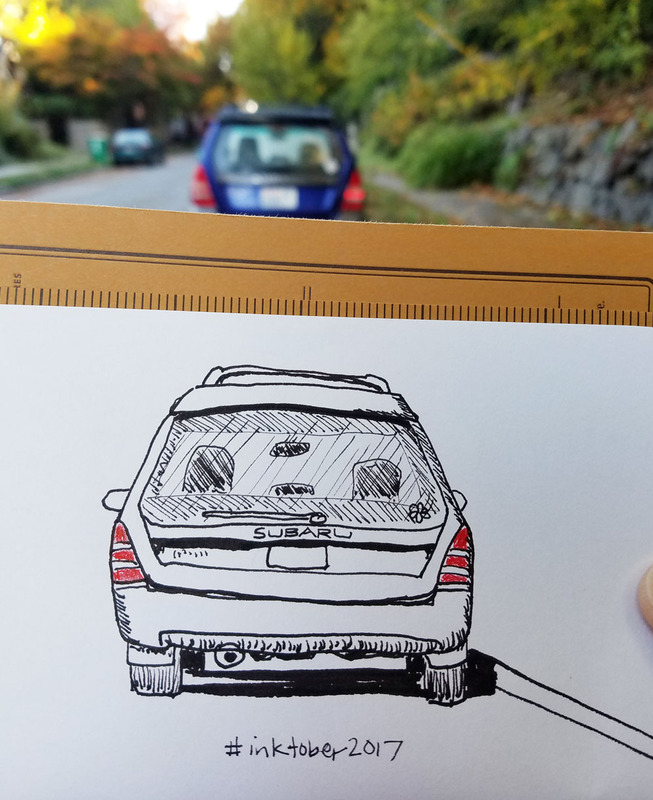 Better paper = less frustration. As mentioned recently, I upgraded my paper to Strathmore 300 Bristol for my graphite class, and I’m very happy I did. 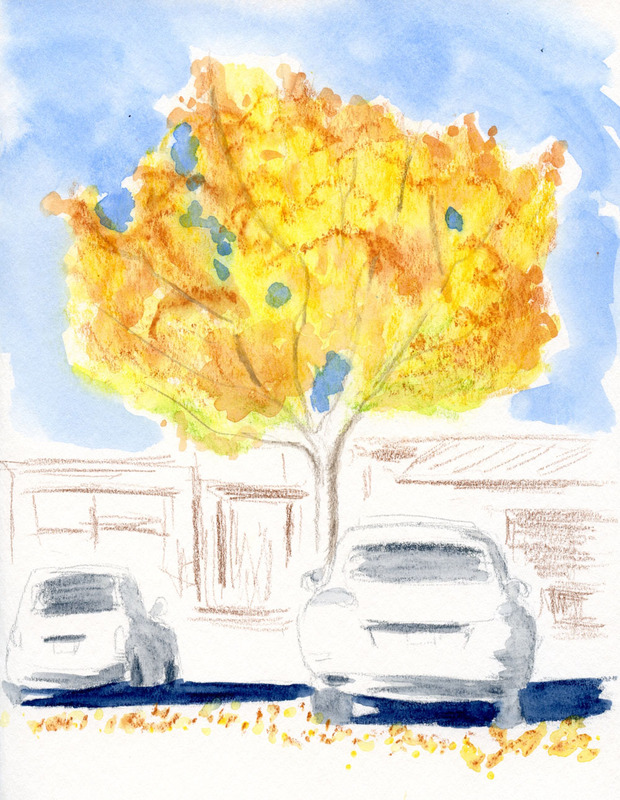 (I used it for my class assignments in tree foliage last week and water reflections the week before.) 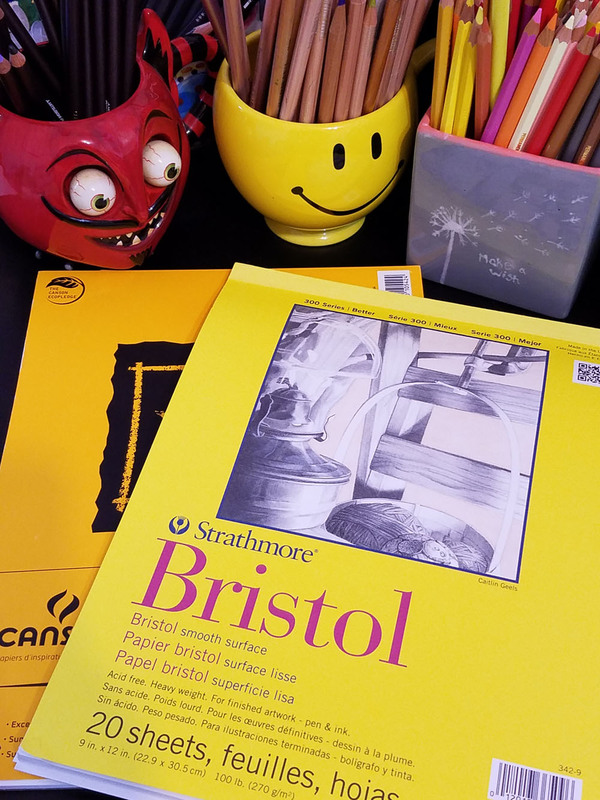 My instructor had recommended the Strathmore for its smoothness, but I already had a pad of Canson XL Bristol, which seemed smooth enough to me, so that’s what I used when I started the class. After a few weeks of vague frustration (Was it my pencils? My paper? Or just me? ), I bought the Strathmore that she had recommended. Instantly I found that it’s much easier to apply graphite to the Strathmore without having to fight the grain that becomes apparent after a while with the Canson. Strathmore is only a little more expensive than Canson, so I can hardly call it an upgrade in terms of cost – but it’s a significant upgrade in quality. If there’s one important lesson I have learned over time (and apparently am still learning) about art supplies, it’s this: It almost never pays to practice with low-quality materials. 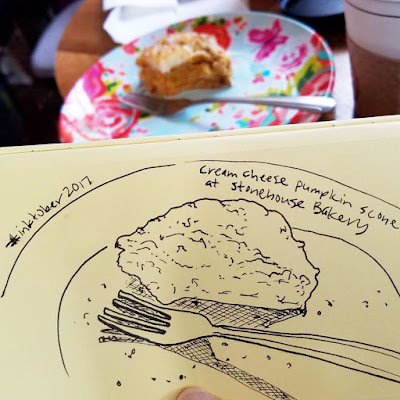 When I have conversations with novice sketchers, more often than not, they will say they are using inexpensive, low-quality materials to start out with because they are still just learning, and once they have more experience, they will upgrade to better materials. This is a paradox because it’s much easier to learn while using high-quality materials. I know it seems wasteful to use expensive paper or paints or even pencils while you are “just learning,” but I contend that you will be less frustrated and learn faster if you upgrade earlier rather than later. Like most, I learned this lesson the hard way. 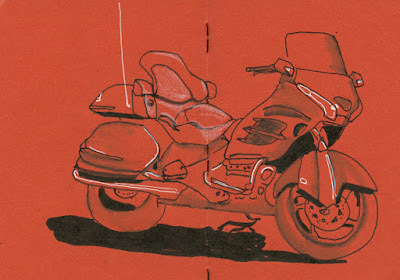 When I first started sketching, I struggled through several inexpensive sketchbooks using watercolor. One day I expressed my frustration to an experienced watercolor sketcher, and she took one look at my sketchbook and said, “Why are you using this crappy paper?” I upgraded, and it made a huge difference. Obviously I’m still guilty of doing this now, especially when starting a new medium: What if I don’t like drawing with graphite? Why invest in good paper right away if I decide I’m not going to continue? But I have enough overall experience now to know that if I’m struggling with something, it’s worthwhile to try a better material as soon as I notice the struggle (rather than waiting until I use up the pad). 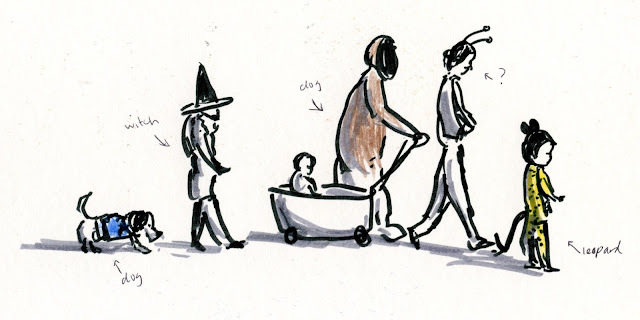 I want to emphasize, though, that everything I’ve said above applies only when my goal is to learn to use a new medium. 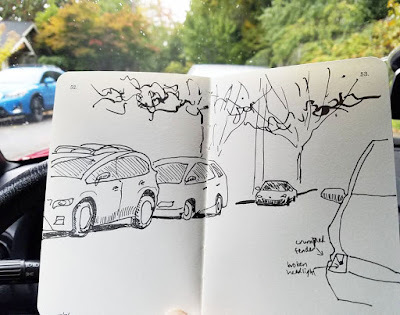 If my goal is to simply draw and draw regularly, then by all means, I believe in burning through as many cheap notebooks and pens or pencils as I can – the more, the better! The Sailor Naginata fude has been on my Top 10 list every year since I bought my first, and I’ve been so happy with it that I rarely use other pens. Occasionally I’ll ink up one or another pen from my epic search just for variety, but by the next inking I always go back to a Sailor. 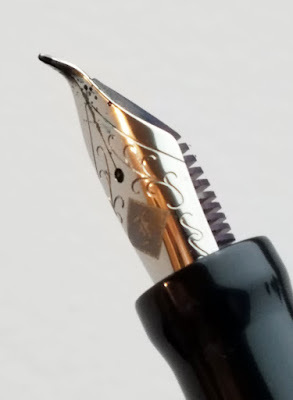 I don’t feel a need to keep looking for a possibly better nib, and I don’t mind feeling smug about something that serves me well nearly every day. However, that doesn’t mean I ignore new nibs that appear on my fountain pen radar. 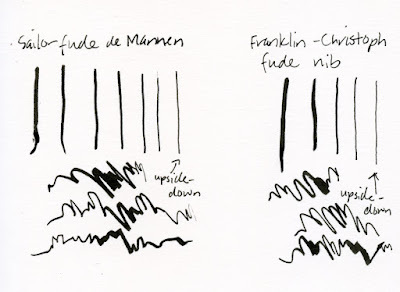 Several months ago, something very interesting caught my attention: the Franklin-Christoph fude nib. This American pen manufacturer wasn’t new to me; in fact, Franklin-Christoph’s music nib was one I considered during my epic search. 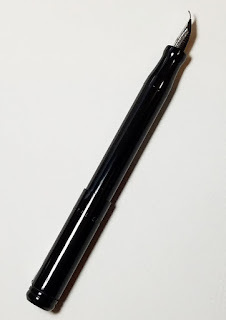 An appealing feature of F-C’s designs is that most of its pen bodies are compatible with multiple nibs, so if you own one body, you can buy a variety of nibs, and each would be at a price much lower than buying a whole new pen. When I learned about the Georgia company’s specialty fude nib, I realized I could buy it and pop it onto the Model 20 Marietta pen body I already owned – sweet! 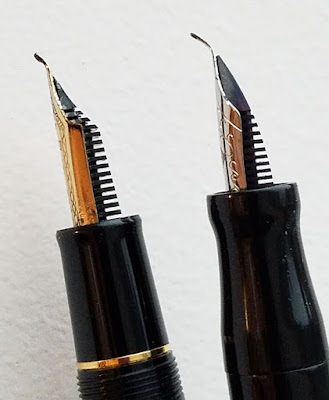 There was one catch: The Franklin-Christoph fude nib was being made on a very limited basis; like Sailor’s fude, it is difficult to obtain (though not nearly as elusive as the Sailor, which seems nearly impossible to find now except on the secondary market). I put my name on the “interested” list. A couple of months later, I happened to be waiting in the TSA line before boarding my flight to the Chicago Urban Sketchers symposium when I received an e-mail informing me that a very limited number was available for purchase. 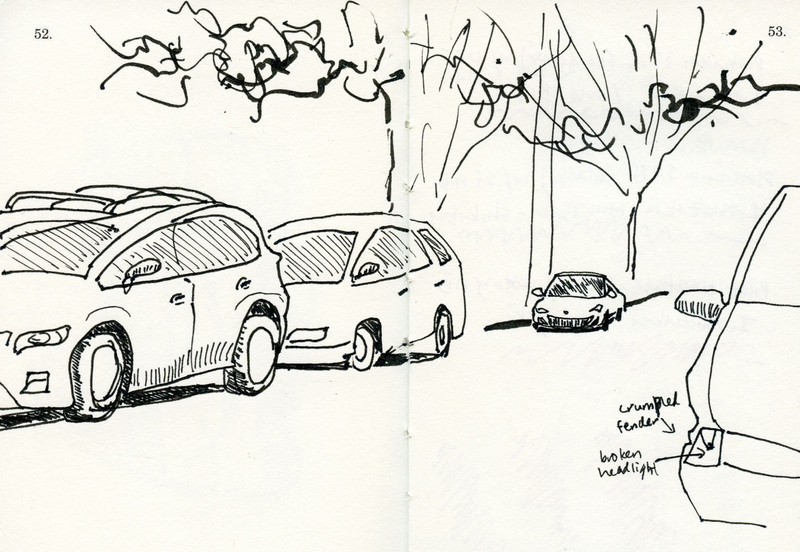 I knew these would be snapped up quickly, so I ordered my fude nib right then and there while standing in line! I wanted to try the F-C nib mostly out of curiosity but, I admit, also with a bit of skepticism. Up to that point, all the fude (which means brush in Japanese) nibs that I was aware of were made in either Japan or China. This makes sense because the curved or bent nib is designed to mimic the up-and-down fluid brush strokes of Asian calligraphy. Using a fude nib for western writing isn’t ideal (as much as I love drawing with it, I don’t enjoy writing with it). 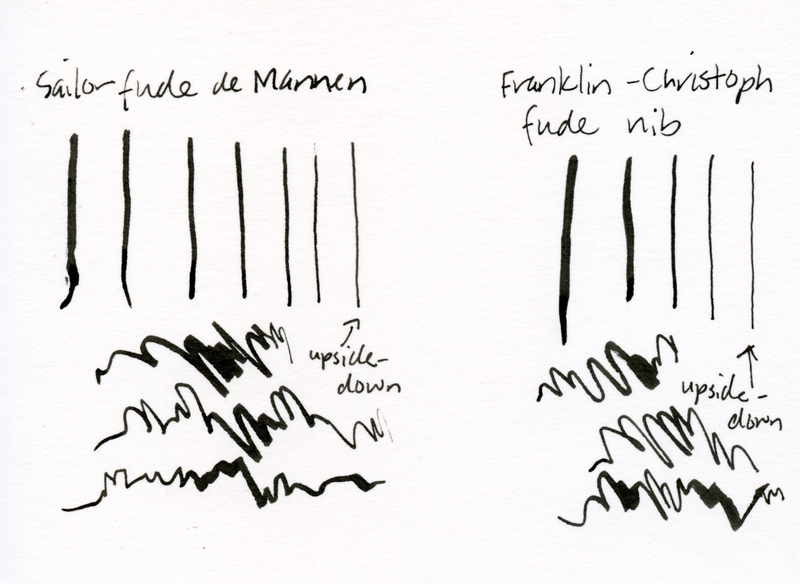 Since this was the first non-Asian-made fude nib I’d heard of, I couldn’t help looking a bit askance. But after giving the F-C a solid two months of testing, I am happy to say that it’s an excellent fude. It’s important to point out that, unlike my Sailor Naginata fude, which is made of 21kt gold, the Franklin-Christoph nib is made of steel. F-C’s nib isn’t quite as smooth and fluid as Sailor’s, but it’s not fair to compare an apple with an orange. The Sailor Naginata also has a gentler curve and a rounded tip that impart an exceptional writing and drawing quality. I love it. That said, if I hadn’t been spoiled by that Sailor for more than two years, I’d say the F-C fude is the smoothest I’ve used. It’s far and away smoother than Sailor’s budget-priced steel fude models (which I had used for years before upgrading to the gold version). I’ve also tried a China-made Duke fude that is remarkably smooth for a steel nib, but it leaks, runs dry and is unreliable in other ways. The Franklin-Christoph was both smooth and completely reliable right out of the box. 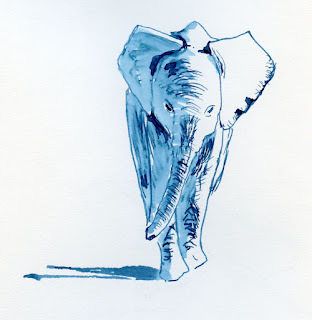 It has remained so after several inkings with both waterproof (Platinum Carbon Black) and water-soluble inks. But what about the most important part – its line variability? Compared to my Sailor Naginata, the F-C fude’s range is very similar: Reversed, the nib is a bit finer than the reversed Sailor. It’s also wetter than the Sailor, so when I’ve used its broadest angle, I have to remember to allow extra time for the plentiful outlay of ink to dry. 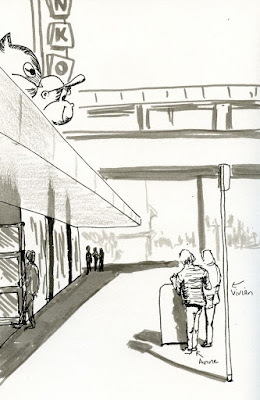 It moves effortlessly and fluidly across the page, whether on toothy Stillman & Birn Nova paper or smooth S&B Epsilon. While I will not be permanently swapping out one of my Sailors for the Franklin-Christoph anytime soon (those Sailor Naginatas will have to pried from my cold, dead fingers), it is more than a worthy stand-in for the elusive Naginata fude de Mannen (which currently has a multi-year wait in the US). In fact, at $55 for the nib (plus $105 to $175 for a body; you’ll need one that fits a No. 6 nib), it’s a fantastic value – a much better value than the premium-priced Sailor unless its golden smoothness is important to you. 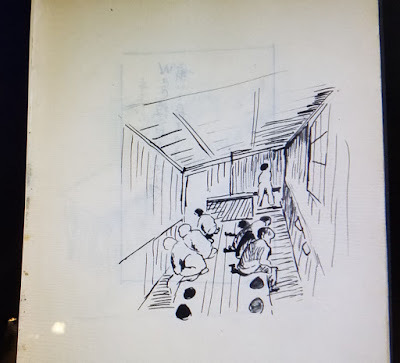 Every now and then a blog reader who is seeking a Sailor Naginata fude will ask me if I know of a source, and I have to give them the bad news. But now I’m going to suggest that they get a Franklin-Christoph instead of torturing themselves with an indefinite wait for a Sailor. It’s not the same, but it’s pretty dang good. 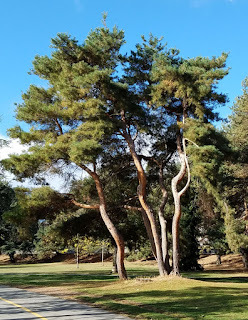 This cluster of trees is something I see whenever I walk around Green Lake. The trees form a distinctive group – growing so close together that they look like they might have been a single tree at one point – so they are unusual and memorable. 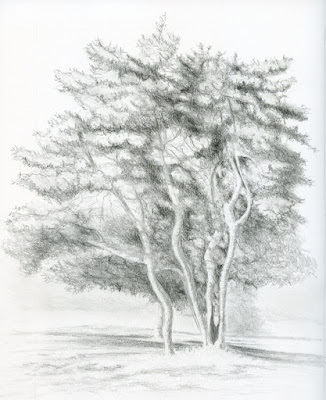 When Suzanne, my graphite drawing instructor, suggested that we bring in our own photos for last week’s lesson on foliage, I knew these trees would make an interesting study. Although I think I did a fairly good job of making the brightly lit trunks stand out from the background, I’m not as happy with the foliage. The branches in the light don’t seem to come forward enough, but I’m not sure how to fix that. As for shadows, I worked through the full range from 2H all the way up to 4B this time, and I finally stopped – not because I think it’s done but because after about 10 hours of work, I’d had enough of it for the week. I’m hoping Suzanne’s feedback will help me figure out what to do next. Compared to clouds (which I prefer to imply rather than draw explicitly) and rocky cliffs and shorelines (which I rarely encounter here in the Maple Leaf neighborhood), trees are something I see and sketch regularly. 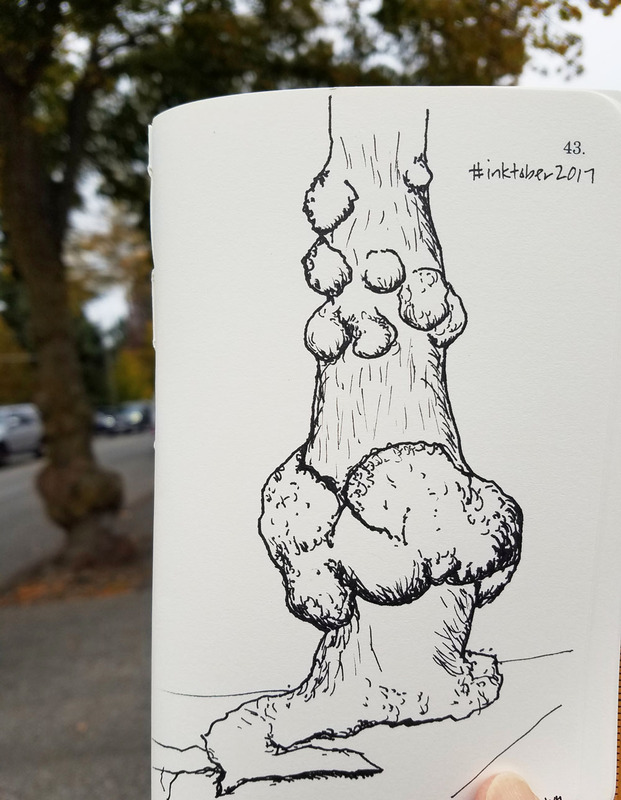 I’m fully motivated to continue learning how to make foliage look more dimensional and tree-like because I think it will help to improve most of my urban sketches. 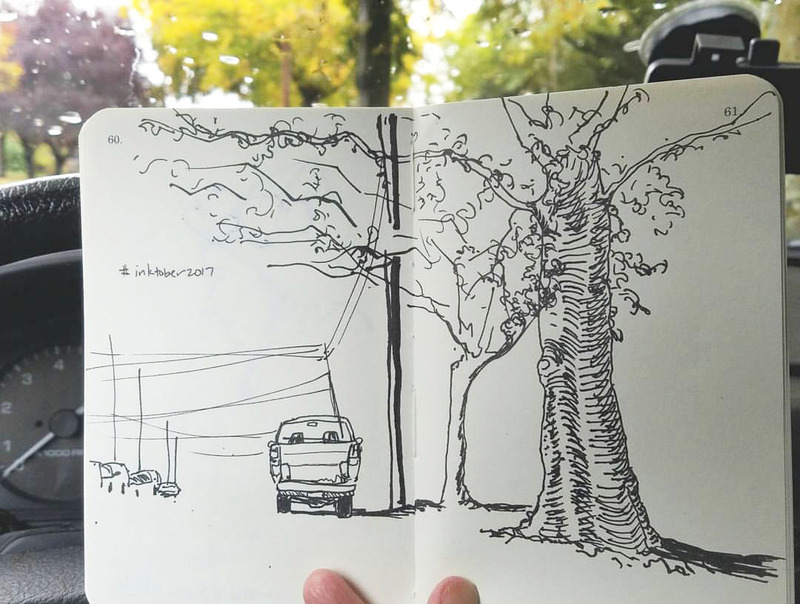 During my first couple years of sketching, trees were such a challenging subject for me that I officially declared them a sketching nemesis. 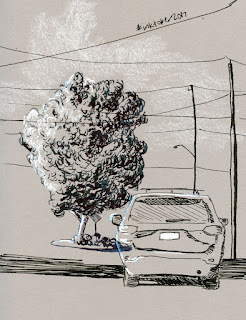 Since trees are (thankfully) unavoidable in the urban landscape, I decided it was easier to face them than run away, and I tried to practice them regularly. 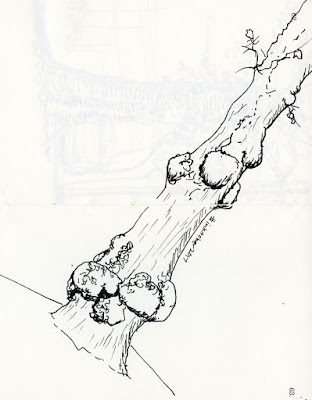 Then, as now, I loved trying to capture the graceful structure of tree trunks and branches (I still enjoy sketching trees more in winter! ), but when it came to foliage, I was always stumped. Buildings or other objects made primarily of planes can be shaded on one side to show their three-dimensional structure. 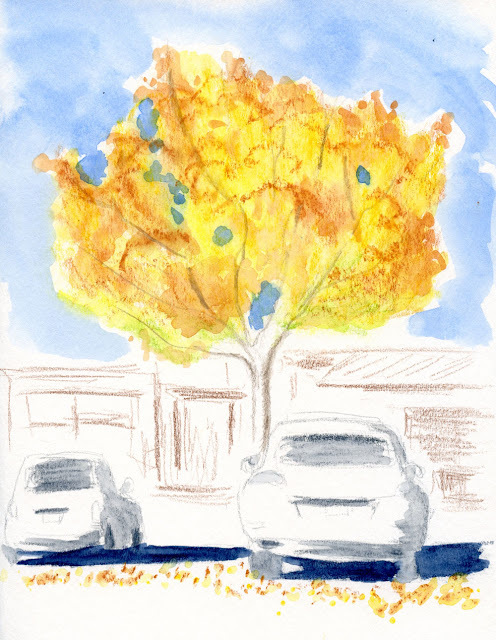 Trees, too, face the sun in only one direction, but they are a hundred times harder to show dimensionally. 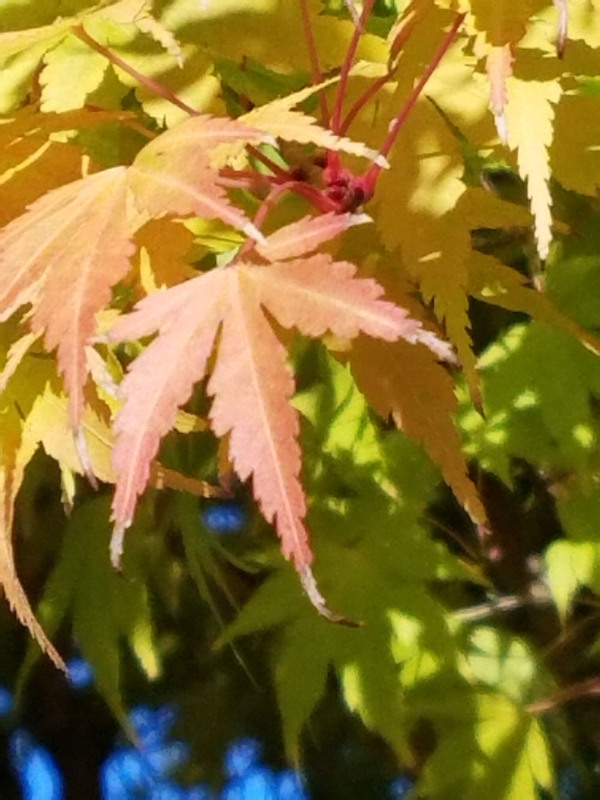 Each leaf casts a shadow in a slightly different direction, and each branch is lighted on top but shaded underneath. The tree as a whole is spherical, cylindrical or conical, not cubic, so the shading moves gradually around it to the unlit side, not at a distinct plane. It’s easy enough to show a tree’s shape silhouetted against the sky, but what about all those foreshortened branches coming toward me? It’s enough to drive a sketcher bananas! 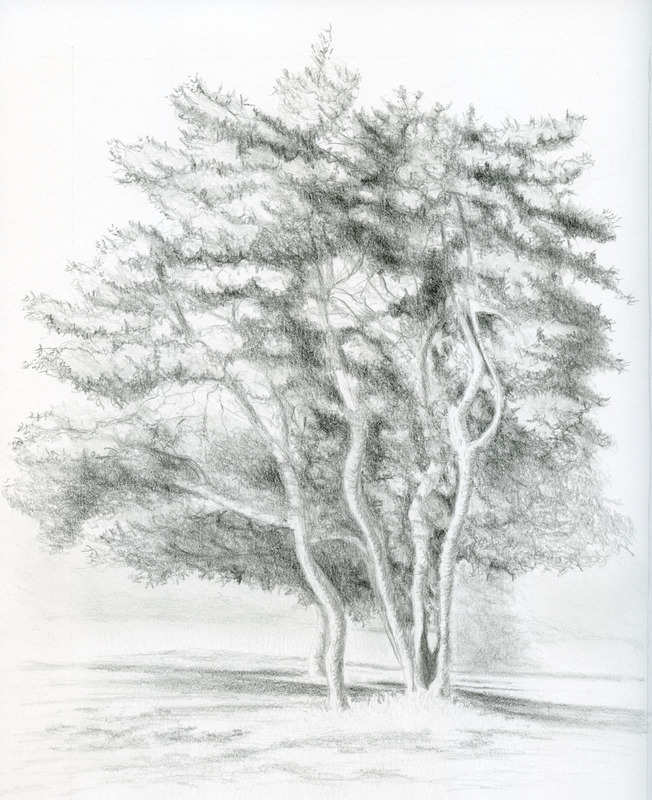 Still, a few years ago when I first declared trees to be a nemesis, I would not have been able to articulate why they are so friggin’ difficult to draw, and now I am, so I guess I understand more about them now than I did then. 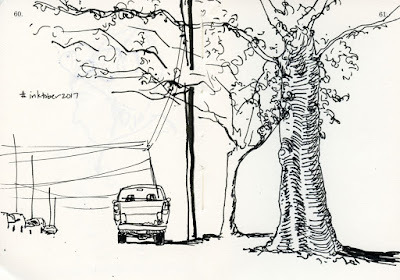 Of course, understanding trees and drawing them are not the same. I’ve been spending so much time this fall working on homework assignments for my graphite drawing class that it’s seriously cutting into my urban sketching, and that makes me sad. I certainly value the concentrated time I’m devoting to class and its exercises because I’m learning so much, and when I’m motivated to learn, nothing beats extended, ongoing practice to help me internalize a process. 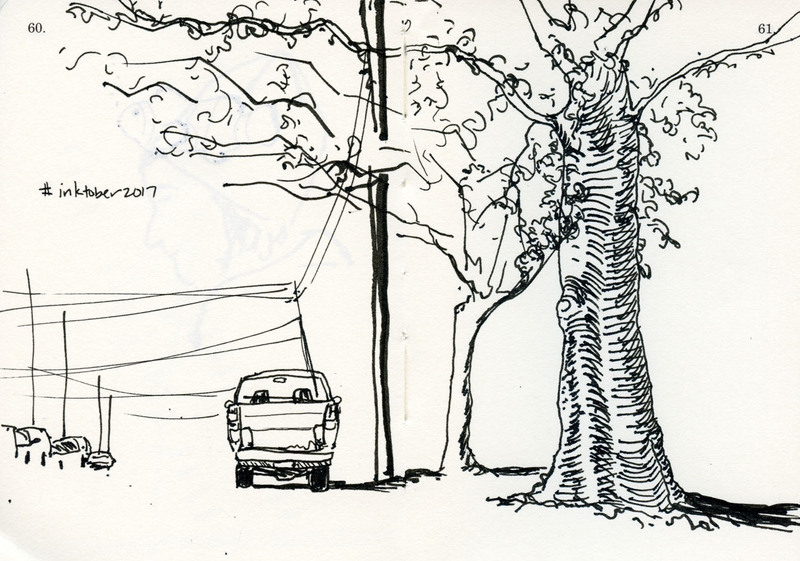 But I still miss sketching on location. 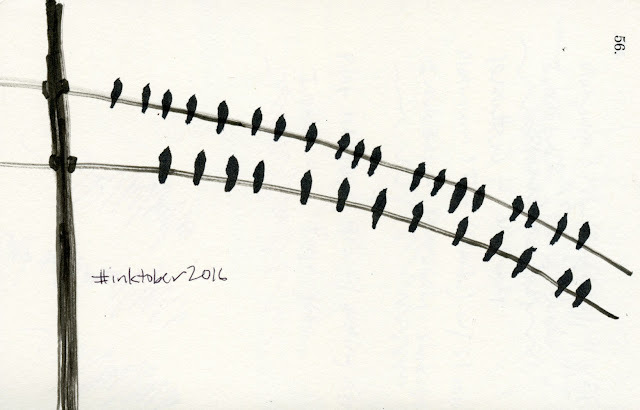 Thankfully, InkTober is taking up a large chunk of this quarter. 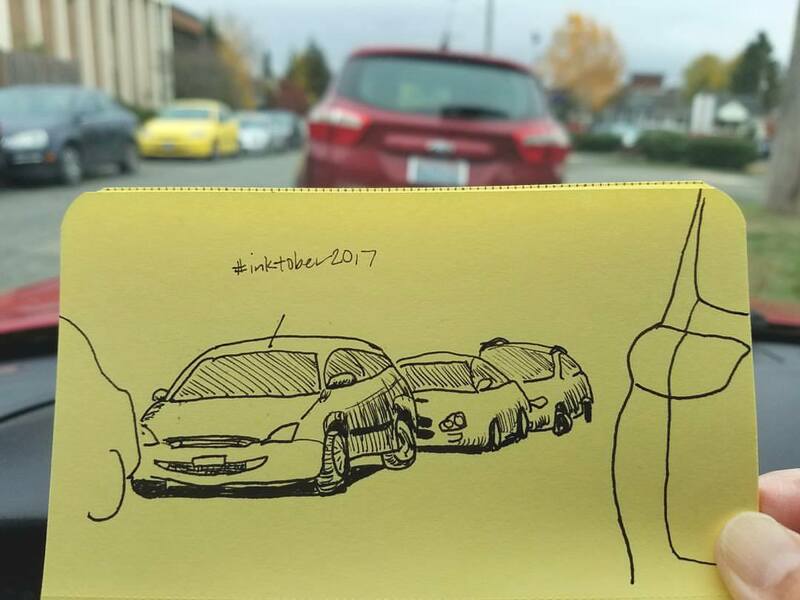 Initially I was afraid that participating while also taking a class would turn InkTober into another “assignment,” spoiling the fun. 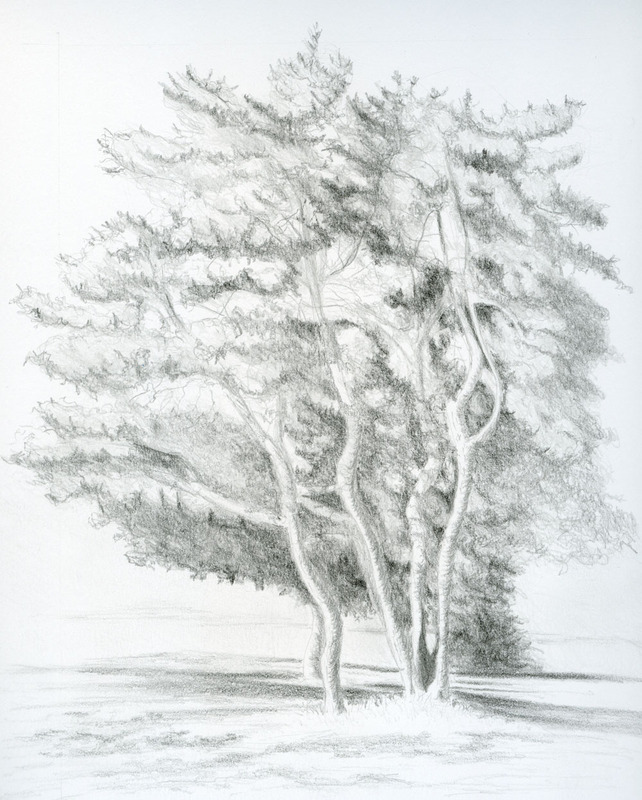 Instead, it has become a respite both from time-consuming graphite and especially from photo-reference drawing. After spending hours at my desk diligently putting various graphite pencil grades to paper, it’s a refreshing break to take a short drive in the neighborhood and make a 15-minute sketch of whatever I can see from my car (it’s been raining a lot lately). Using a fountain pen for InkTober is an interesting contrast in another way. While drawing with a pencil requires the slow, gradual accretion of graphite – a process that allows constant evaluation and incremental changes and corrections along the way, with or without an eraser – ink requires non-equivocal decisions made with a solid, confident line (whether it’s correct or not). It’s a very different way of thinking and drawing. I like both, and I learn different things from each. And I’m appreciating each more through my coincidental focus on both this month.